It’s kind of funny how the invention of one thing results in the invention of something else. For hundreds of years Mediterranean and Eastern cultures have served pureed fruit drinks that resemble what we call smoothies. It wasn’t until the invention of the blender and home refrigerators in the 1900’s that thousands of Americans began experiencing the joy of blended juices the rest of the world and adventurous travelers had known for some time. Refrigeration became available for the home in 1915, even though commercial restaurants had refrigeration for a decade before that. The leakage of certain gases (like ammonia) used in commercial appliances made refrigerators generally unsafe for home use. It wasn’t until the 1930’s that refrigerators became safe, gained in popularity and dropped in price. The timing couldn’t have been better. 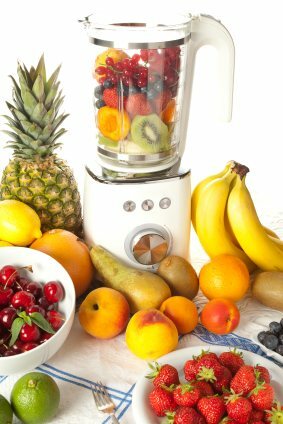 As Americans were discovering the joy of frozen food, fruit and fresh milk in their kitchen, Stephen Poplawski was inventing another popular kitchen appliance – the blender, originally intended to be used as a mixer. Kitchen appliances and cooks had long been chopping, mincing and dicing, but Poplawski’s blender was the first appliance to put a spinning blade at the bottom of a container to do so, making it easier to make milkshakes and soda fountain style drinks at home and in drugstores. In 1935 Fred Osius improved on Poplawski’s idea and invented the now famous Waring Blender. When Osius told a reporter the mixer would “revolutionize American drinks”, he had no idea how true his prediction would be! Prior to refrigeration in the home, the flavors of most smoothies were limited to the fruit that was in season. This meant flavors like bananas, pineapple and strawberries were the most popular and available flavors, and still are. Blueberries, raspberries, cranberries, pomegranates and other more exotic fruit flavors came later, when the fruit could be frozen and stored for use during the off-season. With the invention and use of both blenders and refrigerators, the smoothie began to gain in popularity during the 30’s, 40’s and 50’s. However, what really boosted the smoothie’s popularity was the growth of the macrobiotic and health food movement of the 60’s. According to Dan Titus, the director of the Juice and Smoothie Association, health-food stores began to sell fruit juices and fresh fruit drinks to meet the demand and interest more and more people had in macrobiotic diets and their health. It wasn’t just health nuts and hippies who were interested in building better bodies in the 60’s and 70’s. A young and wildly popular bodybuilder named Arnold Schwarzenegger use to drink a pitcher of beer after his intense workouts. Another well-known bodybuilder at the time, and twice Schwarzenegger’s age by the way, was named Jack Lalanne. Lalanne was one of the earliest juicing and nutrition advocates – and more importantly, one with a television show where he touted the benefits of healthy eating and juicing and was the first person in the US to sell nutritional supplements on television. Lalanne opened the first health and fitness club that promoted healthy eating and juicing in 1936 – helping to spread the word about nutrition, juicing and smoothies to body-builders and weight lifters as well as the public who followed his popular television show about health, nutrition and weight training. Lalanne was the first person to open a combination health-food store and gym, the first to come up with a weight loss breakfast meal replacement drink and to advocate weight training and nutrition. Later in life he even put his name on his own juicer – the Jack Lalanne Power Juicer. Some of his recipes are still among the most popular on the Internet today. History credits the hippies of the 60’s with a lot of things, but naming drinks isn’t usually one of them. The fact is, along with peace, love, flowers and freedom hippies also gave the smoothie its name. 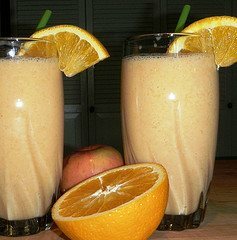 By 1970 a lactose intolerant teenager named Steven Kuhnau began to make smoothies in order to be able to enjoy something similar to the milkshakes most of his peers loved. Unable to digest milkshakes because of his lactose intolerance, he created frozen blends of fresh fruit, ice, and nutrients and fruit juice instead. He was excited to discover that not only did they taste good; they helped control his allergies and blood sugar levels as well. Kuhnau was so excited by his invention he opened a health food store called “The Smoothie King”, and began selling vitamins alongside his healthy drinks. Kuhnau didn’t invent the name. He just branded it, saying the first time he heard the word was in reference to fruit and fruit juice based drinks made by “hippies” in the late 60’s. Prior to Kuhnau’s “Smoothie King”, the name “smoothie was used to describe everything from women’s bras and girdles, to ball point pens, car paint and machinery. There was even a band named “The Smoothies”! It wasn’t until Kuhnau opened his health food store and called his drinks “smoothies”, to appeal to the already health conscious hippies who knew what the term meant, that the name took off. Now, with more than 600 “Smoothie King” stores nationwide today, it’s unlikely the name will ever change. When was the first smoothie made? Smoothies aren’t an American invention. They go back centuries to cultures around the world, and then to South America as a “fruit slush”. But it’s safe to say that the American smoothies, a pureed fruit drink, began in the early 1920’s when Julius Freed, another young man with a sensitive stomach, began looking for a way to enjoy fresh squeezed orange juice. His stomach couldn’t handle the acidity of fresh squeezed oranges, so he found a way and a few choice ingredients to make them less acidic and a little frothy. His friends loved them and said, “Give me an orange, Julius”, and thus his store, the “Orange Julius” was born. Seizing on the idea and the concept of pureed fruit juices from Brazil and other countries, different people created different recipes. The invention of the blender and the refrigerator simply made the drink more popular and more accessible to more people. Smoothies have come a long way over the years. There are hundreds of recipes available to choose from today, on both ends of the health spectrum, containing a multitude of different ingredients. For truly healthy smoothie recipes just poke around my site and try what looks good to you. For many people, including myself, smoothies are a vehicle for transforming and improving your health. Jump on board and enjoy the ride! As always, comments are both welcomed and encouraged. Cheers! Just read the smoothie history. Enjoyed it! What struck me was that grandma was born in 1926 and must not have had a frig while growing up! She was born in the house where Pyka’s used to live, not the hospital. And Arnold drinking all that beer after a workout! Funny! There really are lot’s of smoothies, actually, you can make any flavor you want! I like to mix coffee and strawberry, and milk. The best in the morning. On topic: I did not know that history of smoothies, but I drink them for 2 years now. I drink a smoothie for breakfast every day and occasionally after a big workout in the evening. I have a couple go-to smoothies, which evolve over time. I like to change it up once a week and try something new. As long as your regular smoothie is healthy it’s all good. Although you might want to periodically incorporate a new ingredient depending on your health goals. Is that possible to have this in french? I’m not very good in English, but I would read the story. You could try Google Chrome to translate into French. I am working on starting up a small smoothie shop. I need a few tips on where a great location would be.. a location that has many people who love smoothies – just like I do. I need some tips on where you think a nice location would be? State… City… any suggestions will do. Thank you for the smoothie history article! It is much better than the Wikipedia article about this! I love history and I love smoothies. Can I ask you for original source of these informations? I see if I can track the sources down, Eva. It’s been several years since I wrote this. Thank you, that would be great. I appreciate it. love the article! but i am also looking for the original source, did you manage to find it? Hi Ryan. Great article once again. Just regarding the nutritional info on your chocolate orange smoothie. Would you have a rough breakdown if possible. It’s seriously tasty! !